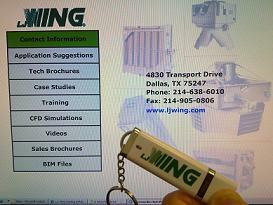 L J Wing is pleased to report that we are entering the electronic era for our Engineering Binder with the availability of the new L J Wing USB Flash Catalog. This new catalog includes the traditional information such as Technical Guides, IOM’s, and Case Studies but also includes some new non-traditional catalog information. The non-traditional information includes PowerPoint based training materials, brief results videos from CFD studies, and downloadable BIM files.